Odyssey lives up to its name. 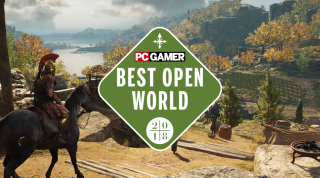 This year's Best Open World Game is the jumbo-sized journey through Ancient Greece, Assassin's Creed Odyssey. Check out the rest of our GOTY awards and personal picks. Tom: At one point Kassandra shoved an important quest item up a goat’s bottom to annoy an NPC. I was sold instantly. Ubisoft’s staggering, detailed rendition of Greece and its ancient islands was also quite nice. Samuel: I thought the Assassin's Creed series was the low point of modern blockbusters about four or so years ago: oversimplified combat, irritating platforming and an icon-strewn map that won't leave you the hell alone. Icon overload is still a bit of a problem, but as of Origins, Assassin's Creed became a series that's great at exploration—Greece is such a different environment from Egypt that the experience of uncovering it feels totally different. The improved combat over Origins, too, and addition of BioWare-style choices made this one of my favourite 2018 time sinks. I just wish Ubisoft didn't sell experience boosters alongside it. They make me think too hard about how much time I'm investing in the game. Andy K: Odyssey’s clever Exploration Mode is honestly a game changer when it comes to open world navigation. Rather than point a big, flashing quest marker at where you have to go, the game gives you a geographical clue to where it is instead. North of this town, say, or west of this landmark. And while it’s usually easy to find the correct location, that little bit of extra legwork, forcing you to engage with your surroundings, goes a long way. You feel like you’re actually exploring and experiencing Greece and its islands, rather than just blindly going where the developer tells you to. And the sidequests are the best they’ve ever been in the series, making spending time in this world actually worthwhile. Steven: What's really crazy is how much Odyssey has in store for players after the main story wraps up. Kassandra's journey to reunite her family is often a great one, but the best parts all happen after, when you get to set out and hunt mythological creatures, uncover your true destiny, and dive headlong into the bizarre meta-narrative that's always been central to Assassin's Creed. It feels like a whole second game bolted on at the end, and it's the first time I've ever felt compelled to actually 100-percent one of these damn games. Fraser: I’ll never finish Assassin’s Creed Odyssey—not at the rate Ubisoft keeps adding to it with post-game shenanigans and new mythical monsters. It’s absurdly big, and some of it’s not really my cup of tea, but I’m in love with its reimagining of Ancient Greece. I’ve traipsed all over it by horse and boat, taking a ridiculous amount of screenshots, and there are still places I’d like to visit. The scale is mind-boggling and attention to detail obsessive, and while that might seem like window dressing, it makes Odyssey’s Greece so incredibly convincing. It’s perfect tourist fodder, but for all the classic sightseeing spots like the Parthenon in Athens or the Temple of Apollo at Delphi, I find myself spending just as much time wandering around admiring sculptors at work, watching wrestlers train or trying to get great screenshots of the game’s many excellent animals. Here's Steven's review of Odyssey.